Being a customer oriented organization, we are engaged in manufacturing, supplying and exporting Bird Spikes. 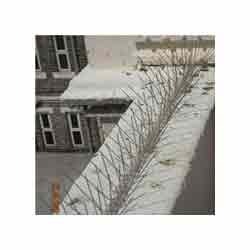 The spikes offered by us are extensively used by the clients at the boundaries, walls and other such places, in order to prevent trespassers from accessing the area. All these spikes are manufactured by using latest machines, tools and high quality material procured from the authentic vendors of the market. While manufacturing these spike, our professionals make sure to follow the norms and standards already laid by the industry. We also manufacture these spikes in custom-built range, so as to meet the needs of the clients. We are acknowledged for offering the best Bird Spikes. These spikes are fabricated using surgical grade AISI 316 stainless steel of 1.55 mm diameter, sourced from the established merchandisers of the market.